Today King David heralds the coming of Easter in Psalm 118. This is one of Martin Luthers favorite psalms. This is the day that the Lord has made, let us rejoice and be glad. Jesus enters Jerusalem as a sight to behold in Matthew 21. Jesus continues to bring His message to the people. Do we heed and follow Jesus today? Prayer: God of wilderness and water, your Son was baptized and tempted as we are. Guide us through this season, that we may not avoid struggle, but open ourselves to blessing, through the cleansing depths of repentance and the heaven-rending words of the Spirit. Amen. 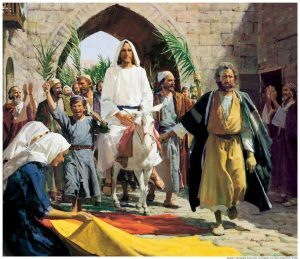 The crowds that went ahead of him and that followed were shouting, “Hosanna to the Son of David! Blessed is the one who comes in the name of the Lord! Hosanna in the highest heaven! Matt. 21:9. When Jesus arrived in Jerusalem, a very large crowd gathered to welcome him. Some of them spread their cloaks on the road for Jesus to ride on, while others cut branches from the trees and spread them on the road. Why would they do that? They were treating Jesus like a king! The people greeted Jesus as a King that day. Today, Jesus wants to be your King, and He will be if you will allow Him to come into your heart and rule over your life. Lay down your cloak to greet your King as he comes to you in love. Jesus, come into our lives and create in us a new heart. May we excitedly welcome You just as those that awaited Your arrival in Jerusalem did. Thank You for being here with us. We praise you Lord! Amen. – Sermons 4 Kids. Prayer: Caught between joy and despair, we yearn for the fulfillment of God’s desire beyond the brokenness and neediness of this life. We offer thanksgiving for God’s presence with us and petitions for the transformation of the church and the world. Prayer: God of our salvation, we give you thanks for Jesus Christ, our Lord, who came in your name and turned the lonely way of rejection and death into triumph. Grant us the steadfast faith to enter the gates of righteousness, that we may receive grace to become worthy citizens of your holy realm. Amen.